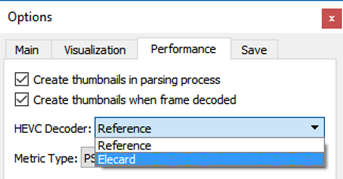 Version 4.4 of Elecard StreamEye provides more metrics for objective quality measurement and supports more raw formats. It also provides richer possibilities for convenient graphical representation of data powered by advanced customization of settings. Elecard StreamEye is now available in 2 versions: StreamEye and StreamEye Basic. We see StreamEye Basic as a must-have tool for QA, technical support and system integration teams, making advanced analyzing techniques more affordable and widely adopted. Check the detailed versions' comparison, their key features and possibilities. Implementation of a new Elecard HEVC decoder which is 3 times faster when compared to a reference decoder and provides response acceleration and better performance. One may choose Elecard in-house developed HEVC video decoder using a menu File- Options. Detection of more than 200 new errors related to deviation from the standard for HEVC format. Additional Filter icon on the toolbar with Interlace mode. It allows selecting a presentation mode (such as Frame/Field/Scaled Top/Scaled Bottom) for an interlaced frame. 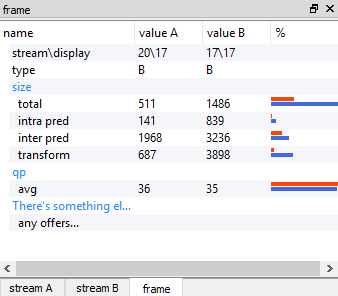 Pixels window for AVC video now displays data for Transform or Dequantize stages. 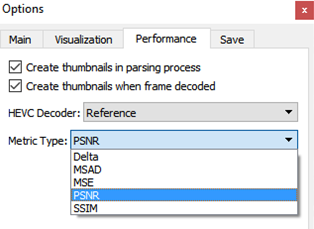 Added calculation of MSAD, MSE, SSIM and Delta video quality metrics when using a reference video file (available in menu File- Options). Additional Overlay Configuration window implemented to fully customize video overlay options. A number of available RAW formats is extended: / I444 / IYUV / P444 / RGB24 / RGB32 / UYVY / V210 / V400 / Y42B / YUY2 / NV12 / NV21. Comparison of statistical data is available for two selected frames. An element description based on the corresponding standard is displayed in a pop-up window when hovering a cursor over the Headers Panel. Saving data into output files: video picture at different decoding stages, Buffer data. An element description based on the corresponding standard is displayed in a pop-up window when hovering a cursor over the Headers Panel. Automatic start point synchronization for two streams using best PSNR value. On-line and off-line types of activation are implemented. Off-line activation includes PC-based and dongle-based activation types. Contact Elecard engineers for more information. Thank you! Your review can make this answer better for everyone. Elecard is a provider of video compression technologies (Linear, OTT, File based) as well as professional Analysis software and Embeded QoS/QoE probe technologies used to enable todays video ecosystem. Elecard supports: MPEG-2, AVC/H.264, HEVC/H.265, VPX, MPEG-Dash, HLS, AV1. Elecard Analysis tools, Encoder platforms and Codec SDK’s enable system architects, designers and QA to shorten development cycles and improve time to market. Thank you for your request. Our manager will contact you shortly! Thank you for the enquiry. We will send you an email with the downloadable link within 5 minutes. Please check your spam folder if you don't receive our message. Thank you for the enquiry. We will send you an email within 5 minutes. Please check your spam folder if you don't receive our message. Thanks for subscribe. Please check your email to confirm.